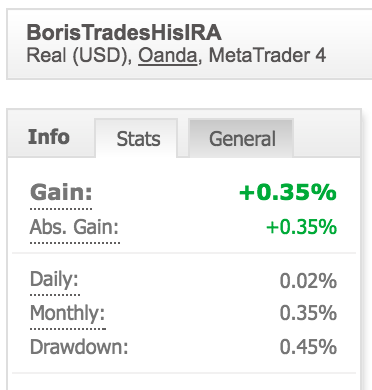 A few weeks ago I took about $25,000 of my retirement funds and put them into my FX day trading account (Yes such a thing is possible and even legal). In less than 10 days of trading, I managed to do 4+ Million dollars of notional volume on the account or about 160:1 leverage off the equity base and yet… and yet… I never lost more than 0.5% of my account at any time during all this trading. That’s right. My equity -- that is the REAL money in my account never dipped by more than 125 bucks. How could I have achieved such risk control (I am up by the way on an absolute basis about 1/2 of 1 percent after two weeks of trading -- but that is not the point) with seemingly such ridiculously high leverage? The answer is size. But not in the way you normally think of size in FX trading. Generally, when we think about margin trading we are conditioned to view leverage as a function of credit. You have $1000 dollars. In US, your broker offers you 50:1 leverage (higher elsewhere) and you can open a trade for $50,000 units. That’s classic leverage and it’s basically the crack cocaine of trading. It gets you hooked and it gets you killed -- well your money at least. There is, however, a completely different way to achieve leverage that does not expose you to any sort of serious risk. It’s called turnover. If you have ever been in the retail business you understand the concept of inventory turnover very well. Basically, if you flip over your inventory ten times you levered your working capital by 10:1. Put simply you used the same $1000 dollars to buy $10,000 worth of merchandise. Day trading is the exact same thing. You can lever your position by borrowing money from your broker and be at the mercy of the market, or you can lever by making lots of small but frequent trades and expose very little of your account to risk. My average trade size on that $25,000 was only $5000.00 units. That’s right I actually traded at less than 1:1 leverage. I was UNDERLEVERED at 1:5 size. That’s why no single trade, not even ten bad trades could hurt me. Size will forgive almost all your trading sins and is far more important than any strategy you use in achieving long-term success. Novice traders always have their priorities wrong. To stay alive and thrive in trading first things first. Get that order right and you can trade forever. Get it wrong and you’ll just be another 90 day blow up statistic in the forex market. Oh just in case you doubt me -- here are the stats.